The lymphatic system is a part of the circulatory system whose primary role is to provide an alternate route for the return of interstitial fluid into the blood vascular network. To bathe the cells of the body and provide nutrients, nearly 20 liters of blood plasma is filtered through capillaries every day. A large proportion of this tissue fluid finds its way to the veins. However, the lymphatic system processes nearly 20% of this fluid. The lymphatic system consists of open-ended vessels, lymph nodes, and organs such as the tonsils, spleen, and thymus. Unlike the blood vascular system, lymphatic circulation is not a closed loop. It creates a one-directional flow of lymph towards the heart. Lymph reenters the cardiovascular system at subclavian veins situated near the neck. Image shows the lymphatic circulation, with the network of lymph vessels, and major organs and nodes. Lymphatic circulation is necessary for homeostasis since it maintains the fluid balance between tissues and blood vessels. This role becomes apparent when there is an injury to a lymph node. Water retention, also known as lymphedema, in a limb is one of the side effects of a blockage within a lymphatic vessel or node. This is particularly true after cancer treatment since surgery, radiation therapy, and chemotherapy can injure this intricate network. Lymphedema can be mild or severe, sometimes even leading to the thickening of the skin and compromised immunity. In the image above, both the legs show some lymphedema, with the right foot showing greater swelling. Lymphocytes are a group of white blood cells that are found in the nodes and organs of the lymphatic system. They include B-cells, T-cells, and natural killer cells. Lymphatic vessels non-specifically collect the fluid surrounding tissues. This means that the lymphatic system often carries pathogens from different parts of the body towards lymph nodes. B-cells and T-cells of the adaptive immune system reside in lymph nodes in addition to circulating through the body. The maturation of T-cells, as well as the production of antibodies from B-cells, is driven by their exposure to pathogens in the lymph nodes. Other immune cells like dendritic cells have a supporting function in the adaptive immune system, presenting antigens in a way that stimulates differentiation and antibody production. The presence of macrophages, with extended finger-like projections called pseudopods, allows the lymph node to trap foreign objects, filter lymph, and remove microorganisms. Different lymphatic vessels drain into nodes situated across the body. Vessels from the head and arms drain into lymph nodes at the elbows and armpits. Lymphatic circulation from visceral organs drains into nodes between the lungs or situated around the intestines. These nodes become the central points at which the contents of interstitial fluid are examined and many harmful substances are removed. While this usually means pathogens or cell debris, lymph nodes are also the first point of colonization for metastatic cancer cells. In fact, surgery for breast cancer can involve the removal of the major lymph nodes of the armpit as a precautionary measure. Traditional medicine in many countries pays attention to the lymph nodes and considers their optimal functioning as crucial for the maintenance of good health. Lymphatic circulation is made up of lymph vessels, lymph nodes and organs such as the thymus, tonsils, and spleen. Lymph vessels are thin-walled structures. 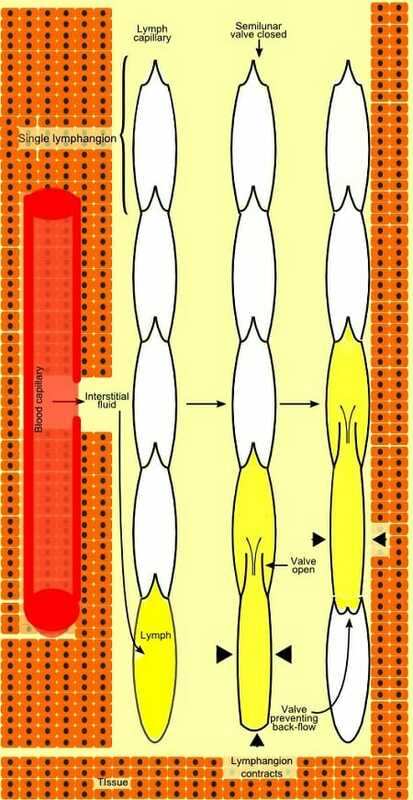 They have an inner layer of endothelial cells and a layer of smooth muscles and valves that prevent the backward flow of fluid. Lymph vessels are attached to surrounding tissue through connective tissues called adventitia. Each lymphatic vessel consists of serially arranged structural and functional units called lymphangions. A lymphangion is a segment of a lymphatic vessel bound by semilunar valves on either side. When circular smooth muscles of these vessels contract, lymph is moved from one lymphangion to the next. The valves ensure unidirectional movement of lymph fluid. The contraction of skeletal muscles surrounding these vessels can also power the movement of lymph. The image is a representation of how lymph is propelled along lymphatic vessels. These organs are small bean-shaped structures made from intricately arranged tissues. They have a dual role in the circulatory and immune systems. The lymph nodes are present deep within the body near the lungs and the intestines as well as near the surface, as seen in the clusters of lymphatic tissues near the armpit and groin. Afferent lymph vessels enter the node at the convex side. 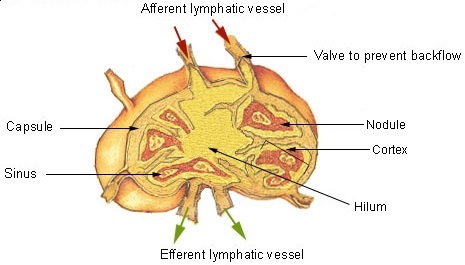 Efferent vessels leave from the hilum of the concave surface. Every lymph node is covered by a fibrous capsule that also creates finger-like projections into the lymph node itself. These projections provide mechanical support and structure while also dividing the lymph node into a number of lobules. Image shows the cross-section of a lymph node, with the incoming and outgoing vessels, their valves, fibrous capsule, and the subcompartments called nodules. Connective tissues within the lymph node provide attachment sites for the cells of the immune system. The lymph node contains B-cells, T-cells, macrophages and dendritic cells. When an infection is detected, the lymph node can become enlarged. The thymus is a primary lymphoid organ where T-cells mature. The organ has two lobes, each divided into an external cortex and internal medulla. T-cell maturation is facilitated by the epithelial cells of the thymus when they present antigens to these evolving lymphocytes. As T-cell precursors mature within the thymus, two events occur. The first is a positive selection that verifies if the T-cell has receptors capable of recognizing MHC molecules that will present antigens. The second is negative selection, which removes T-cells that attack the body’s tissues and resident flora because they respond to antigens from these cells. Positive selection occurs in the thymic cortex before maturing T-cells move towards the medullary region for negative selection. A large proportion of T-cells do not successfully navigate these two stages of selection. When negative selection is not stringent, it can lead to auto-immune disorders. Tonsils are lymphoid organs containing antigen presenting cells called M cells. These cells alert B-cells and T-cells within the organ. The tonsils are located towards the back of the throat, at the intersection of the respiratory and digestive passages. This makes the tonsils the first line of defense against ingested and inhaled pathogens. The spleen is primarily associated with RBC turnover, but it also plays a role in the lymphatic system, clearing bacteria and other pathogens that have been coated with antibodies. Cell-mediated immunity from T-cells is also seen in the spleen. There are two common disorders affecting the lymphatic circulation – either water retention in tissues due to impaired lymphatic drainage, or swelling of the lymph nodes. Both of these disorders can arise from a number of causes, from injury to the vessels and nodes, to infection or cancer. Lymphedema can arise from some medications, radiation therapy, infections due to bacteria or even parasitic worms. Lymphatic filariasis, also known as elephantiasis, is a common disease in many tropical countries, which spreads through mosquito vectors. The causative agents are nematodes with a large proportion being caused by Wuchereria bancrofti and Brugia malayi. Occasionally, other diseases such as tuberculosis, leprosy, or repeated strep infections can also cause lymphatic drainage to be affected, and result in lymphedema. Lymphomas are a group of cancers that arise from the unchecked growth of lymphocytes. Most often lymphomas are diagnosed after a painless enlargement of a lymph node is detected. While there are many subtypes of lymphomas based on cell type and location, two main categories are Hodgkin’s lymphoma and non-Hodgkin’s lymphoma. Interestingly, intense itching is a common early symptom of lymphoma. It is likely mediated by small molecules called cytokines that can act as neuromodulators, therefore creating the sensation of itching. Lupus is an autoimmune disorder where the cells of the immune system attack body tissue. This disease can present differently in each person since it can involve practically every tissue in the body. Joint pain and fatigue are common symptoms. Lymph node enlargement is seen as the disease progresses. 1. Which of these statements about T-cell maturation is true? 2. Why is massage sometimes recommended to reduce lymphedema? 3. Which of these are symptoms of lymphoma? 4. The lymphatic system is important for which of the following reasons? 5. Why do the lymph nodes typically swell up when a person gets sick?